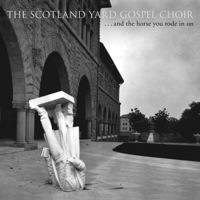 History lesson: Scotland Yard Gospel Choir‘s “Tear Down The Opera House”, off their upcoming junior LP …And The Horse You Rode In On, is not a brand new tune. In fact, it was a prominent force on their debut release, I Bet You Say That To All The Boys. For their forthcoming album, SYGC reworks the track, negating much of the rough, lo-fi elements of the original and quickening the pace. The troupe even goes so far as to toss in multiple vocals during the chorus and drops in a little guitar solo where before any solo (if one was present) was drowned out by the excessive percussion and guitars. The melodies are the same — the lyrics as well. Despite the quicker tempo, this new version has added length, which stems from the extended bridge and subsequent return to the chorus before concluding. The original lacked that return. 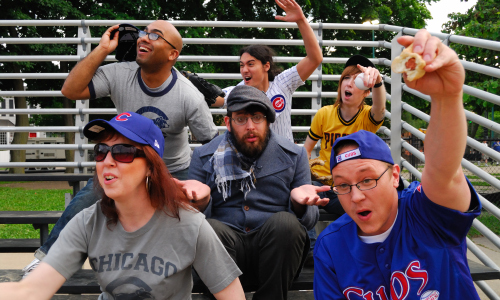 Back to back, it’s easy to hear why Scotland Yard Gospel Choir made the change. The original wasn’t bad; it was just average in comparison. Why hone in on all these elements? Well, it adequately demonstrates the bands progression over the years. Throughout their songwriting, they’ve moved away from that gritty, raw, lo-fi sound and replaced it with a cleaner punk-influenced jangle-style of pop. SYGC’s new album comes out September 15 on Bloodshot Records.